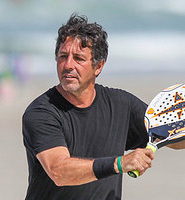 Scott Freedman has been the world’s #1 ranked paddle tennis player for several decades, He has won the World’s Men’s Singles Championships 19 times, the World Men’s Doubles Championships 16 times, and the World Mixed Doubles 14 times. Freedman is the winningest player in the history of the sport with 191 professional titles. He is the only player in the sport’s history to capture the “grand slam” of paddle tennis--the World Championships singles, doubles and mixed doubles in the same year. He has done that several times. He recently wrote a book, “Paddle Tennis and Tennis: Anyone Can Play” to try to raise the level of awareness for his sport. He is known around the world for his accomplishments.